The holiday period is over, kids back in school and most of us settling into our usual routines. I am back at work after a wonderful break in Noosa spending time with close friends and reconnecting with the things I loved to do when I live there a few years ago. Early morning walks into Noosa Heads, a refreshing swim at Little Cove, (practically deserted) at 5.30 in the morning, a long walk back for great coffee and conversation with those special friends who, when you see them again after a long period of time away, you pick up exactly where you left off. I have come back to Brisbane feeling refreshed and revitalised with COMMUNITY my theme for 2019. In my private Facebook Group every day there is someone with a question or concern about a particular situation they are struggling with, someone may celebrate a win they have had with a legal decision, they have started a new job, finally been able to purchase their own home, or share opinions about dating sites and so much more. I am mindful that this is what community is all about and this year one of the keys things I am doing is making sure there are many opportunities to step out of the online community to actually connect with each other in person. Now to get to the Feeling Like I Don’t Belong part. This past Christmas all my close family were doing other ‘things,’ that didn’t include me …….. and I found myself struggling with this strange feeling of not belonging. It’s hard to describe exactly how I felt other than to say it was like there was a massive shift in my family unit as I have known it and it totally threw me off balance. Now, after 8 years working with women at all stages of separation, divorce and helping them rebuild their lives after divorce, I know that many people experience something similar from time to time and yet it’s the first time I have actually been emotionally impacted. Which brings me back to my theme for the next few years of building COMMUNITIES. Communities of women far and wide, who meet face to face, perhaps over coffee or a glass or two of wine, who share their stories, their struggles, their wisdom, their love and their support for each other. Our world so desperately needs women to look out for each other, to encourage and support each other. For women to know at the very core of their being that they are enough just as they are. I will be doing all I can to impact as many women as I can in 2019. My clients are so open and forthcoming about the very private details of their lives, they allow themselves to be raw and vulnerable, to express their thoughts and feelings honestly. For many of them the decision to end the relationship was not theirs to make, it had already been done and they were left to deal with the fallout, facing an uncertain and unknown future. For the ones who are unhappy and dissatisfied with their relationship, struggling with a feeling of unrest and discontent it’s like being caught between a rock and a hard place. Reaching that point where there are one of two choices to be made, the day you realise the pain of staying will be greater than the pain of leaving and choosing to step off the edge into an uncertain and unknown future. Like many women who find themselves in this situation, I had unconsciously distanced myself emotionally and physically for a number of years until one day I crossed that threshold, that point of no return, I had reached my ‘tipping point.’ That one more thing when in an instant I knew I was done and I also knew it was a case of damned if I do and damned if I don’t. The fallout of this decision spread far and wide as very close family and life long friends distanced themselves, as I watched my children hurting so much that it broke my heart, as rumors spread and as my husband did everything he could to salvage our marriage knowing that I had reached the point of no return. If you find yourself caught between a rock and a hard place, in a position where you are struggling to make a choice between two possible alternatives, before you do anything else it is important for you to get very clear about your decision, once you choose to walk a different path there is no turning back. Knowing what I know now and having someone in my corner to support me, someone to walk the path with me, to help me navigate through this time would have made an incredible difference to me and to my life. To help you with whatever is going on in your life right now, some area of your life where you may be feeling some internal conflict, this exercise will help you gain more clarity and help you redirect your focus towards what you want to be different. Fold the paper in half and only work on the Contrast Column. Make a list of all the things you feel are ‘wrong’ with your partner and your relationship, the longer the list the better. Spend the time to work through this, come back to it over a few days and keep adding more things as they come to mind. Once you have run out of things to write, open the paper and as you read each item on the Contrast list one at a time, write what it is you do want and how you would like things to be different. Having completed both columns, fold the paper again and now only look at the list in the Clarity column and read through each one of them, make any changes as they come up for you. There are several benefits to using a simple and easy exercise like this, it will assist your decision making, it may even open up the opportunity to begin a different conversation with your partner. Remember: You cannot unring a bell! Once something has been said or done and the wheels are in motion it cannot be undone. 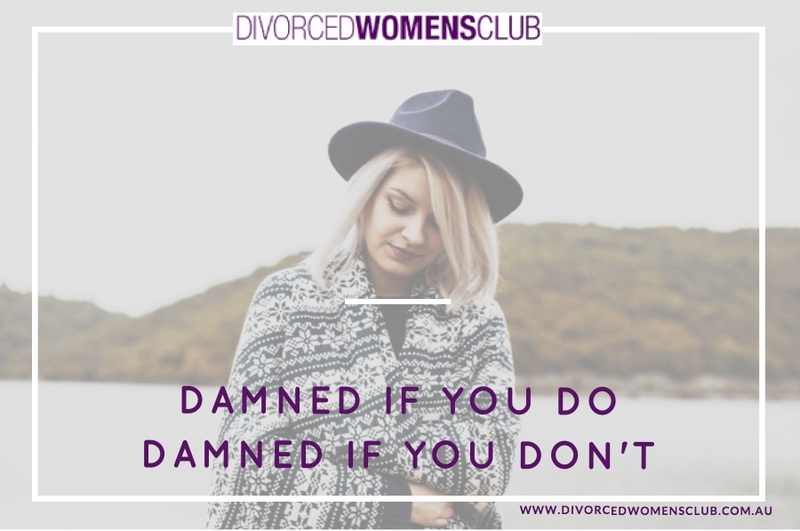 Jenny is an absolute advocate and champion for women rediscovering themselves through the process of divorce. If you’d love a quick chat with Jenny about anything, even your favourite wine, click here. Jenny will be in touch as soon as she’s finished.